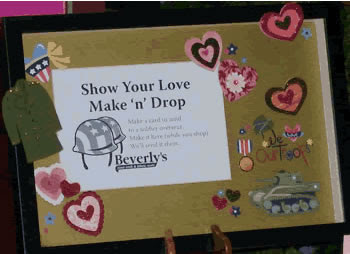 Beverly's Official Blog | News and findings from world of crafts, scrapbooking and more: Valentines for the Troops! The Monterey location of Beverly's Fabrics (2090 Fremont St) has set up a table at which visitors can create a Valentine card to be sent to a sailor, soldier, airman, or marine deployed to a combat unit overseas. Customers are invited to use the supplies provided by the store and personalize a message of thanks to the service member. The station is currently open and will remain available during business hours through the 28th of January. No purchase is necessary to participate. We'll even mail the cards for you! Easy Apron to Make - So Cute!